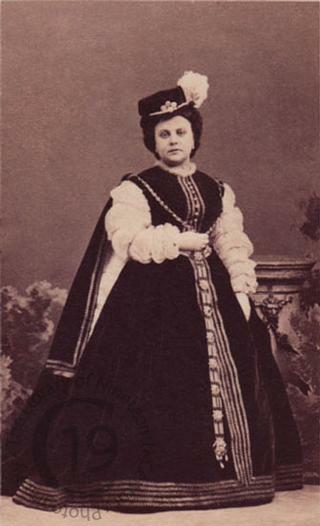 A carte-de-visite portrait of Pauline Lauters-Guéymard dressed as the eponymous heroine of Maria Stuarda. Based on the life of the tragic Queen of Scots, the opera is a tragedia lirica in two acts. Written by Gaetano Donizetti to a libretto by Giuseppe Bardari, it is based on Schiller’s 1800 play, Maria Stuart. It received its première at La Scala on 30 December 1835, with Maria Malibran in the title role.